Happy Spring! 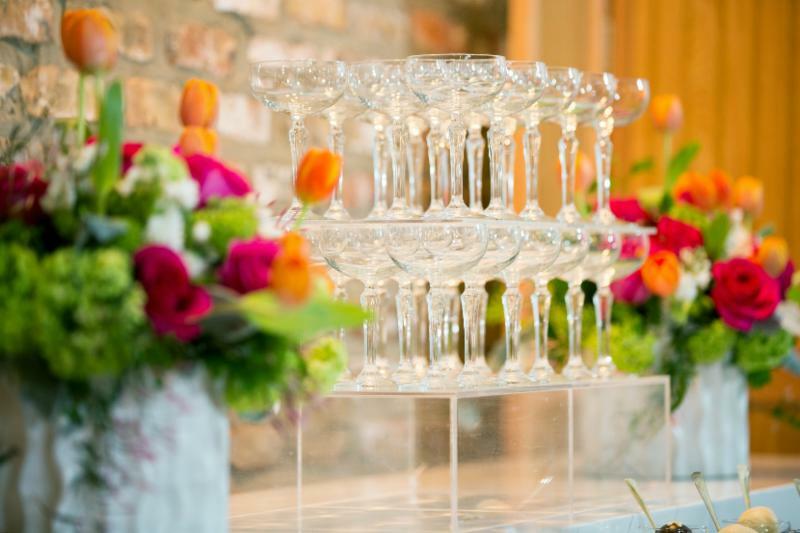 And, what better way to celebrate than with "A Bloomin' Bubbly Bar" designed by Sue Waarich of Food Evolution with floral décor by Alexandra Jusino of Exquisite Designs. 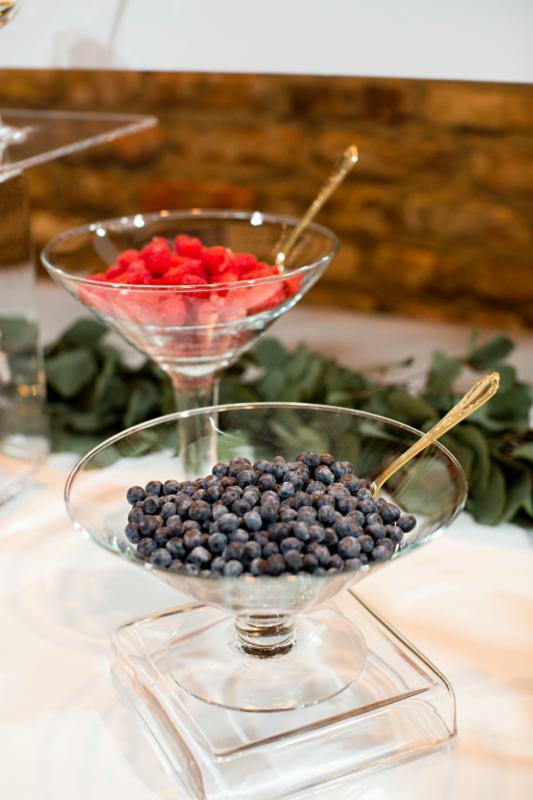 The two have worked together numerous times and we have gotten to know them well through all of the tastings they continue to do in our showroom. 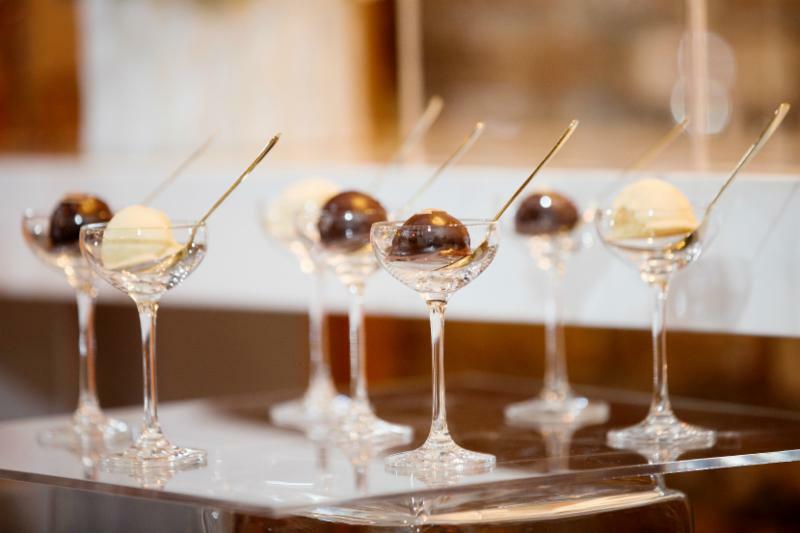 Not only does Sue want to make sure that her clients have tasted food prepared in an off-premise environment, but she also wants to make it easy for her downtown clients to come for the tasting. She also thinks showroom tastings have had a great impact on her up-selling her clients (and we sure are lucky because of that). She is quite proud that her closing statistic from tastings is well over 90%. We had an interesting discussion over lunch on trends and the trickle downs from fashion to special events and the delay on trends migrating from the coasts to the Midwest, but everyone agreed that even ten miles out of the city, trends are different. So what are the hot trends from Sue and Alex for right now, right here? Mixed metals! 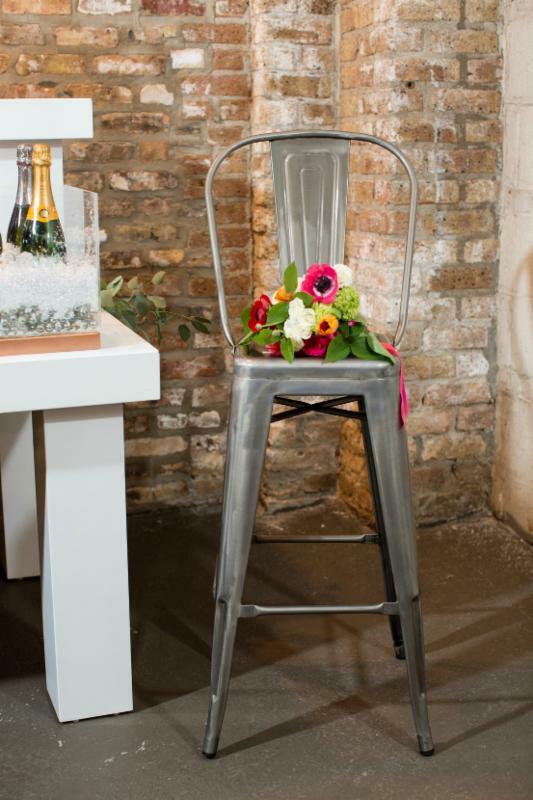 Illustrated here with our Copper Ice Tub/Wine Cooler, our Ornate Gold Flatware and our new bar stool in our French Industrial line of steel metal chairs. 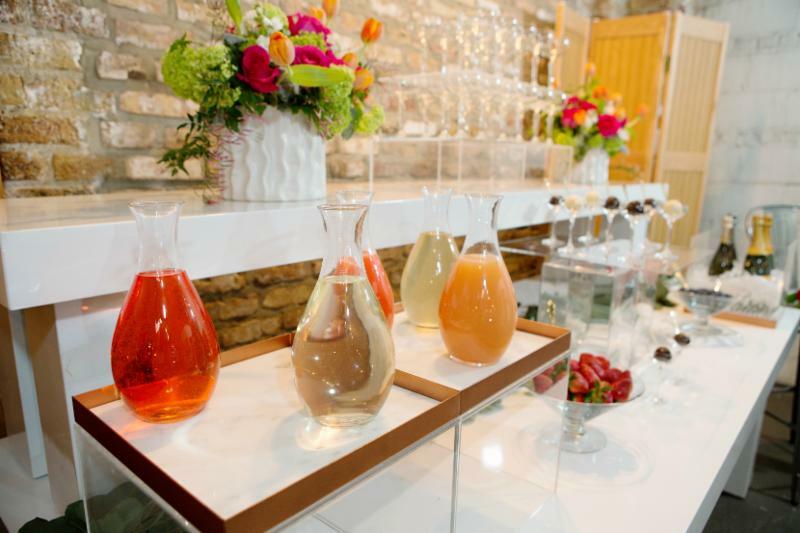 Look at the colors of the fruit juices as even they have an array of colors to complement the mixed metals. So do the foil wrappings on the champagne bottles. Look closer at these two photos and you will also see the clever use of our new Copper Square Contemporary Tray with Marble Insert. 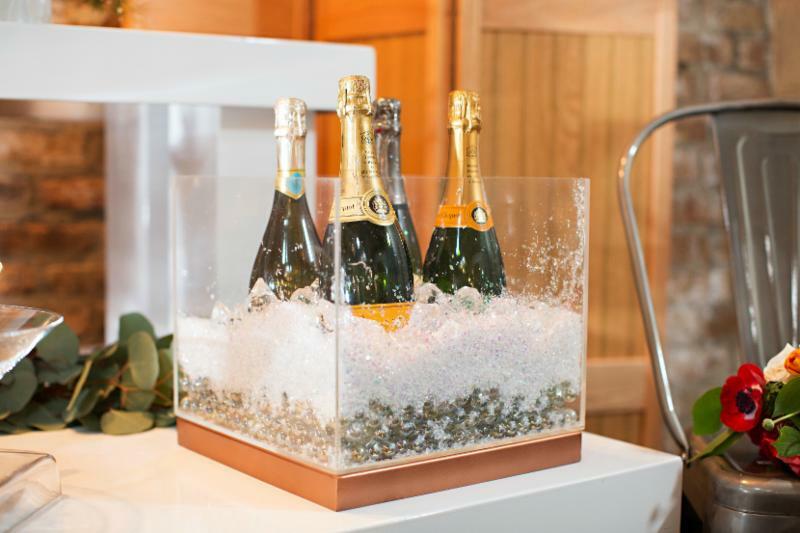 It is used both as a base for our Clear Lucite Box turned upside down to become a festive champagne bucket as well as on top of our Clear Lucite Boxes when used as risers to display Glass Oval Decanters. Those weren't the only clever use of risers. 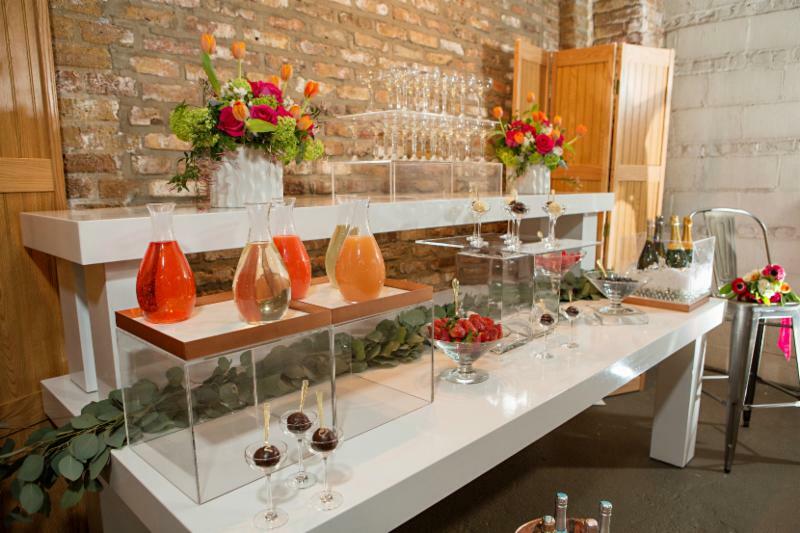 Here Sue used our Contemporary Glass Beverage Urn base with our Lucite Square Server and then used the top of the same urn as a smaller riser for a Footed Martini Glass Bowl. Sue admits to favoring clean lines in her buffets and using our White Lacquer Bench as a riser gives simplicity in the design and yet with its size makes a statement of grandness. Exquisite Designs' eucalyptus garland complements the design so well and gives yet another layer of texture and interest. 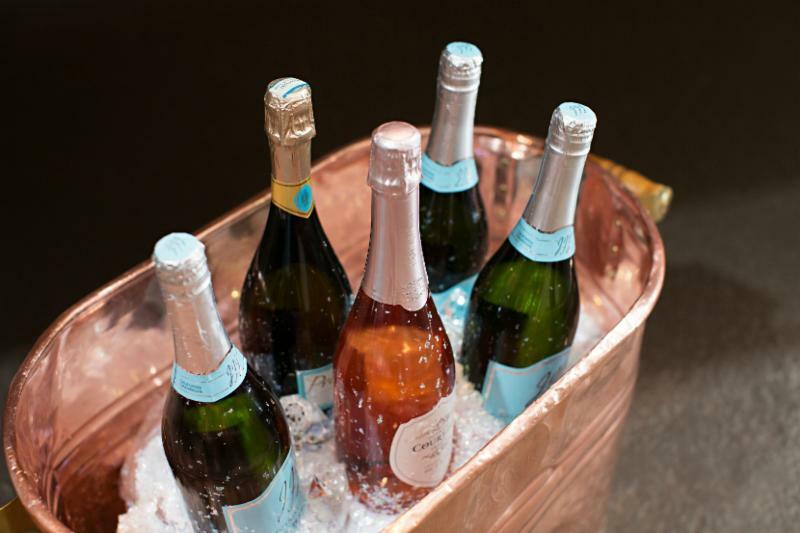 So what is a Bubbly Bar? 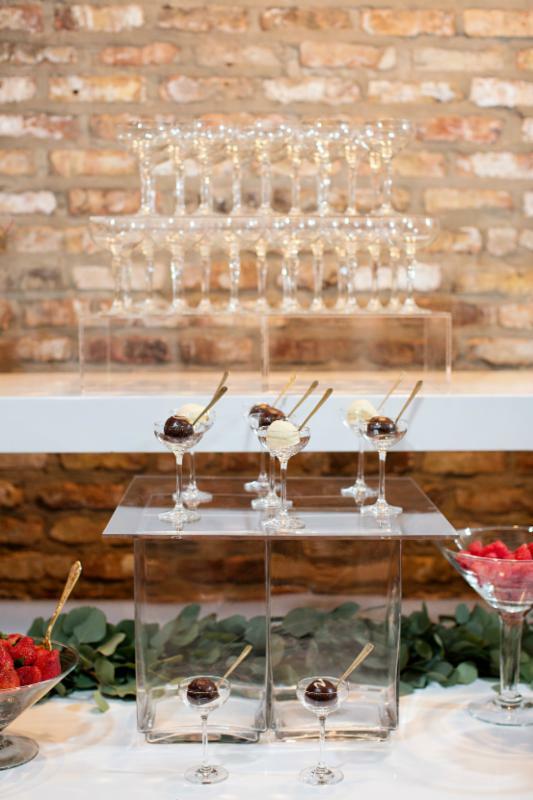 Sue has used this concept before and enjoyed taking her popular idea and tweaking it with totally different rentals than she had used before. 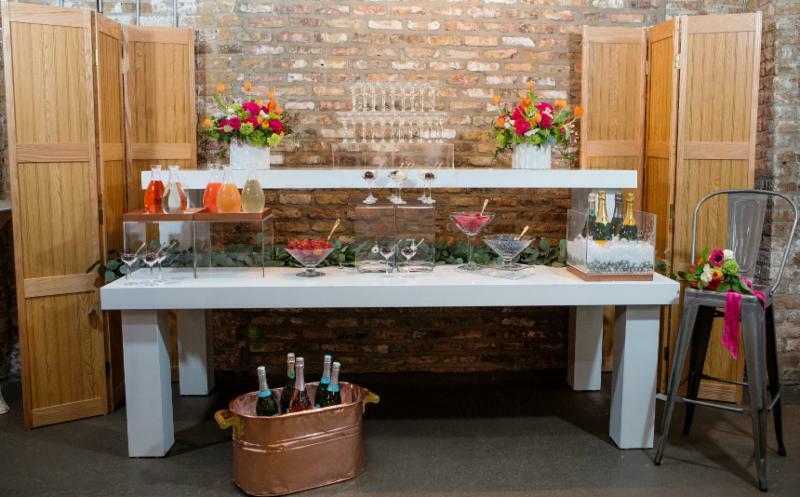 For a tight-budgeted client, rather than a full bar, it is such a festive interactive bar, whether used at the entrance of a party or a wow factor at a dessert buffet. 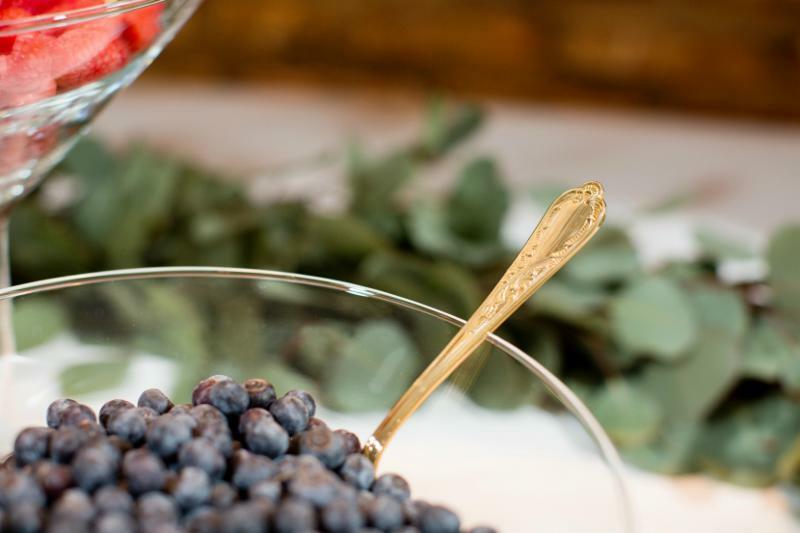 Guests select fruits and/or sorbets and the bartender offers an array of juices and champagne to totally customize each glass.